towards great skin – and it seems that Sanctuary Spa may provide the affordable and effective solution you’re looking for. little addition to any routine, and so much better than a face wipe. elasticity, without a greasy or heavy finish. To ensure a fair trial we had a mix of ages (from 20 to 54) and a variety of skincare backgrounds; two thirds of testers had experience with facial oils previously, giving them a great benchmark, but a third (5/10) were completely new to them. 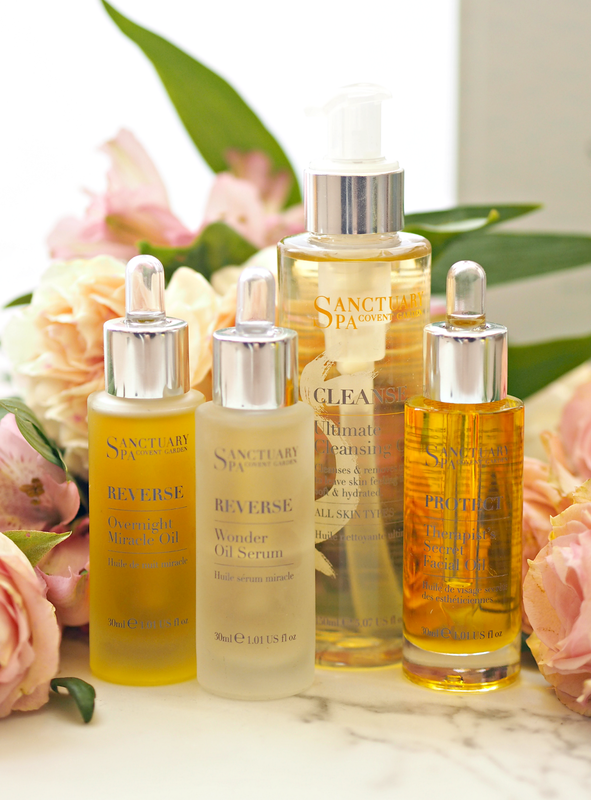 Reassuringly, 100% of readers felt the Sanctuary Skin Oil was easy to slip into their regime; this means that everyone can embrace a facial oil on a daily basis, without worrying about extra time or faff. A rather positive 80% said their skin felt healthier, smoother, more hydrated or more supple in the weeks they were using it; the remaining 20% were unsure as they hadn’t quite seen the results they were after yet (but are continuing to put it to the test.) 94% of my testing panel believed the skin oil had been a pleasure to use, with only one being unsure because of the texture; however, 100% of readers vowed to keep using the Sanctuary Skin Oils beyond the perimeters of the trial, proving the ease of use and pleasure they can offer. 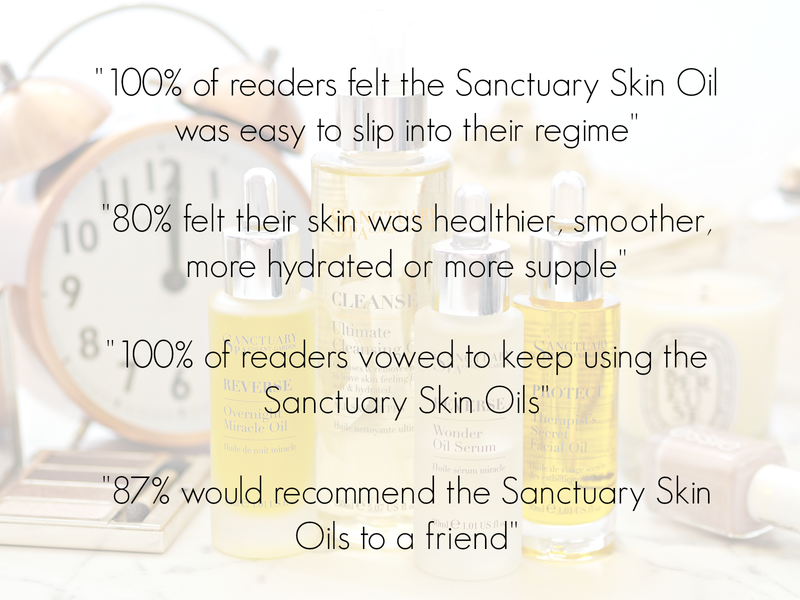 The important bit is that 87% of the testing panel would recommend the Sanctuary Skin Oils to a friend, with the remainder being unsure and awaiting further experience before making a decision. Having been using these oils myself, I can agree with the panel completely; the oils are luxurious, easy to use, non-greasy, deliciously scented and definitely leave my skin feeling hydrated and supple. 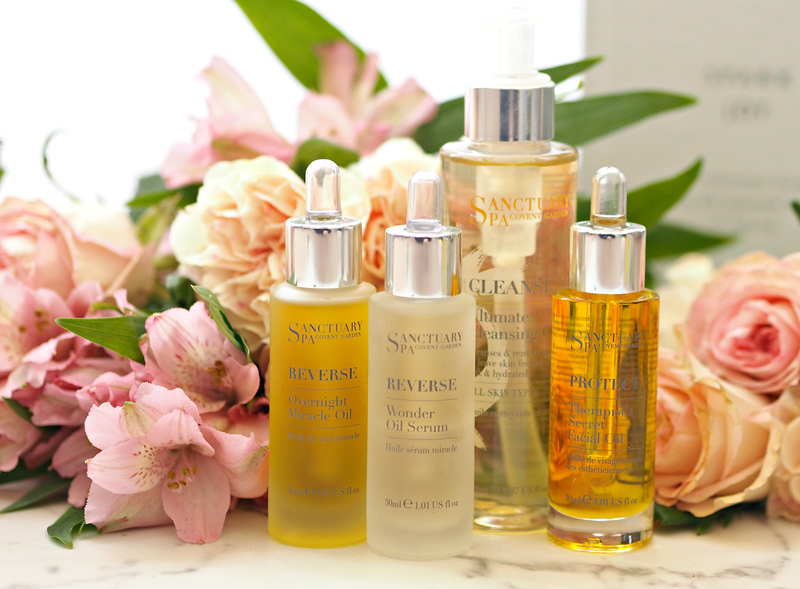 You don’t have to spend a fortune on skincare to get great results, and Sanctuary Spa have created something that proves that entirely. If you’re convinced by my panel of testers to give them a go yourself, you can find the Sanctuary Spa facial oils nationwide via Boots stores and online, priced between £12.00 and £19.50. This is a sponsored post on behalf of Sanctuary Spa; all opinions are my own; all testimony provided by readers with no incentive or bias; 15 women between 20-54 took part in the trial for between two and four weeks. Oil actually attracts oil, so they're better for your skin than you think. Cleansing oils are an alternative to other types of cleansers though, and not to be used instead of a face oil – you can use both!